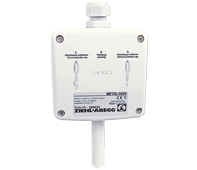 Can provide accurate measurement of both relative humidity and temperature in air conditioned and refrigerated conditions. The sensing element contains a special protective coating for use in polluted environments. Relative humidity measurement range: 0-100%. The temperature measurement is made by the change in resistance on the built-in PTC (Positive Temperature Coefficient) element (KTY81-210). High grade sintered stainless steel element acts as a filter against contaminants. A combined sensor designed to measure CO2 concentration, relative humidity and temperature. Typical applications include occupied spaces such as office buildings, conference rooms and education centres. Measurements can be taken either separately or combined. Values are shown alternatively on an integrated display.